mammalwatching.com is 10 years old this year and I’d like to update and improve the site to celebrate. Whatever I do will be subject to the twin constraints of my very limited web skills and a strong desire not to spend any money. 1) I wondered if anyone could recommend any favorite Birding/wildlife sites to give me some ideas I could shamelessly steal? 2) Can you let me know the things that you like, and don’t like, about the current site and the blog, suggestions for improvements etc etc. Would you ever consider migrating the current blog/forum to a more traditional forum format? It might stimulate participation from a broader group than the small handful of people that currently post. Congrats on 10 years, Jon. (And on getting all the sciurids of North America). This site had a lot of influence on me, much like the birding listserves did. I had never even heard of a Kangaroo Rat until I read about it here, much less would I have set out to see all 22 species of Chipmunk in NA. Mammalwatching.com seems OK, but I was thinking the same as Matt about this blog. A lot of forums are much easier to use, though I don’t know of any free software for it. A search function would be good, IMO. My understanding is that it’s much easier to add search function to the rest of the cite than to the forum. As it is now, Jon has to manually link all interesting forum posts and comments to relevant country pages to prevent them from being functionally lost. Also, adding search function wouldn’t work well because all trip reports other than Jon’s are in different formats: Word, PDF, even forum entries at other forums. The only way to make them fully searchable would be to convert them all to locally stored HTML pages, and I don’t know if this can be done even in theory without spending a few hundred man-hours. I’m one of the ‘broader group’ mentioned above that doesn’t tend to contribute but has lurked and used mammalwatching for ideas and inspiration. Congratulations to Jon for such a great site – no significant changes needed in my opinion. I have often wondered however if the community is big enough to support a ‘wiki’ type approach. Say the best places see each species(?) with a link to the appropriate trip report/paper. A quick scan suggests there a few examples out there in the birding world (mostly focused on specific sites or regions). I agree that a forum would work much better than the blog format although it would also increase the amount of work for Jon (deleting spam, moderating etc). Perhaps other people could help with moderation duties. One thing I dislike about the current blog is when new posts are added, it becomes difficult the keep track of the older posts still generating discussion. Often people add comments several weeks later and few people read them. Ideally adding a new comment would bring the post to the top of the news feed. If a forum is too much work, perhaps a Facebook page or similar would work better? I think the website itself is fine, but agree that going to a forum format would improve discussion. Jon, congrats on 10 years. I know I speak for many people when I say that this site and all the effort you put into it is greatly appreciated. I have learned a ton about mammal watching locations from this site and I dare say made some friends through the course of a shared passion. You would need moderators but I am sure that folks would volunteer to help out (consider me one). Jon, I’ll echo the above congrats. This has been an invaluable site for my own trip planning. Plus I’ve met a number of great folks through it. 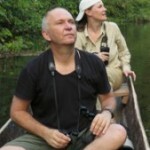 I really like the mammalwatching.com site, especially the format of your trip reports. I always look forward to a new one. On the “blog versus forum” format: I have mixed feelings. On the one hand, the blog currently functions more as a forum than a blog, albeit with the limitations as described by others above. So it would seem it would function better with a “forum” format. That said, I sometimes find forums maddening. Far too often, they attract internet trolls who want to argue more than share information. I hate when I visit an interesting forum and have to wade through pages of hunting debates, spam, random people who have no expertise but will posit opinions, etc. I know some of this can be solved with moderation, but that takes time. And I suspect all of us would rather focus on mammals than policing a forum. One possible solution to this is to start a page on Reddit. There are Reddit groups for nearly any interest, but not mammal watching. This would not really be much work because we could have multiple moderators — I suspect even all the regulars here could get “moderator” status. Reddit has pretty strict rules on spam, off-topic posts, etc — so you can eliminate participants who don’t follow the rules. But it may just be replicating this site. Dear all, thanks so much for the comments so far. This is really very helpful. I totally agree that a within site search bar will be useful and think its actually quite easy to do and should be able to pick up content of both HTML and PDFs etc. I wold love to get more people posting on a forum. I agree with Mike R that one current problem is that new comments on older posts don’t get seen and this is an issue. But I’d be interested if others could explain a bit more other reasons why they think other forums work better, or what puts them off this one… is it the wordpress format that is offputting, is it too hard to post etc? It will really help me to think through the best way to change… I know there are many people who read but don’t contribute and so I would love to make it easier to contribute, or more inviting. Maybe a Reddit page will be the way to go Matt (I just added mammalwatching – thanks!) and will look into this too. Jon, post a link to the reddit page when available–I can’t find it at the moment (maybe it has to be approved first?). I would suggest looking at some forums and see how they function. Check out Safari Talk (mentioned above): their forums are pretty extensive and would take a lot of time to police. They also have http://10000birds.com/separate area for debate — but I always find that debate forums cater to people who have an interest in debating. That starts to get far away from the original intent of a forum in my opinion. Another interesting (to me) forum is http://roughfish.com/ (this is for people who life list fish species caught). It is set up so people can post forum topics, trip reports, new life list entries, etc. Probably far more extensive than necessary here, but maybe it gives you ideas. I think a strength of this site is that there are not trolls and endless, pointless, nasty arguments. It would be nice to have more participants, but I can’t emphasize enough the importance of not inviting that element. The blog structure is a barrier to entry for me because it seems like it’s mostly dominated by the serious mammal watchers (Jon, Vladimir, Coke, etc.). I have a more casual interest, so I often feel like questions or comments I have would be wasting space. I think a different format might remedy some of this. Having said that, I think Matt is right, that a forum can very quickly become a total mess, full of trolls, unrelated material, and spam. It seems like something between a true forum and the current blog might be best. Reddit is an interesting idea, and I think it would work well for posting links to images or articles and text only posts, but maybe not for trip reports with text and images embedded. A Facebook group may also be worth looking into. One feature of forums that is good is I can subscribe to a thread without having to post something. So if someone replies months later I get an email about it. Some of the more specialist forums have strict rules to reduce spam, trolling etc. I know that goes against the nature of this community but insisting that members use their proper name as a username (as opposed to a pseudonym), strictly banning any form of advertising and insisting threads are kept on topic would go along way in reducing the problems associated with many forums. I am no expert on websites, blogs,forums etc. I would just like to say I am a big fan of mammalwatching and I am grateful to Jon and all of the contributors for the work put into the website. I am very happy with the site just as it is. Hi Jon….I also like the site as it is and am not a big fan of standard type forums, which are often hijacked and can become trivial. The only real change that I would like to see would be the inclusion of a great search engine, but I am not sure how feasible or time-consuming it would be to produce something really worthwhile. Would be great to be able to search by individual animals, areas, reserves and contributors etc, but I am hopeless with almost all technology and have no idea of the work or cost involved in creating something like this. I guess that all of the source material would have to be saved in one compatible format and am not sure how possible this is given that many trip reports are simply links to external websites? Hi Jon. Thanks again for the site and bringing enthusiasts together. I would suggest that the country (and state) sites be set up as 1) Key Site summaries 2) Field Guides and Checklists 2) Trip Reports. Residents or regular visitors to those countries could help with those summaries and keep them updated? Jon, I echo everything said about the value of the site even if it is frustrating that your list and mine were virtually the same when the site was started but now they are miles part. Role on retirement, mine not yours. One thing that I’d been intending to start a post on was the inclusion of a good guide directory. As people who have read my reports will know I’m not a massive fan of guides and prefer to find my own mammals but it’s not always possible and there are some very good guides out there, sadly in the minority, and to hold these all in one place rather than having to search through reports to work out who’s good and who isn’t, would be useful. It would be equally useful to highlight the ‘to be avoided at all cost’ guides although we obviously need to be more careful with that. Having something set out by country with the following information would be good. Jon, I echo everything said about the value of the site even if it is frustrating that your list and mine were virtually the same when the site was started but now they are miles part. Roll on retirement, mine not yours. Well, Matt (in Idaho)’s thoughts are certainly valid. There are a lot of trolls on forums who like to argue, and it isn’t pretty. I don’t do Facebook, FWIW. I reached a point where wasting time figuring out sites like that just wasn’t worth it. I hope this blog doesn’t go there. Don’t know anything about Reddit. One gripe about WordPress is that you can’t see the author of a post when you go to the website, although the author appears in the email I get telling me about the post. Someone once griped to V about not saying his name, I’m pretty sure the whole thing was about that. So, Jon, there are no easy answers, LOL. Facebook would be the worst possible outcome as far as I am concerned and although a forum would almost certainly attract more visitors, whether the majority would contribute anything positive is another matter entirely. At the moment, although not that many individuals post, other people are certainly using the site and those that do post, provide the type of specific information that has made this website so unique and so useful. It may be case of quality rather than quantity, as it would be very easy to dilute the material that appears here. Sometimes different is good and it would be a shame to end up with just another free-for-all forum and to risk losing the unique appeal of the site for most current visitors. I, like a few other people who have commented earlier, don’t comment on this site very much, but use it as resource to gain information on places I may visit. For this purpose, the wordpress platform is pretty good, but my two suggestions (which others have said earlier) are a more convenient search function and if possible, a way to pull back up older posts that are commented on so that the comments are not missed altogether. I don’t think a facebook group would be a good idea. Putting a mammalwatching forum on facebook would cause a lot of off-topic discussion on things like birds, etc. and also bring in a bunch of people who wouldn’t really contribute. Forums bring this same problem: for example, a bunch of wildlife or protected area-related threads on safaritalk.net are hijacked and turned into places where various people go on emotional tirades on hunting, among other things, of questionable accuracy. Ultimately, the information on here has helped me a lot while planning trips over the last few years and I would hate for this resource to become diluted. I’ve found a number of nice mammals with it and would love to continue to. I have been a weekly follower of this site ever since it only consisted of a wallpaper and some info on Australia. It fits so well with the hobby. – I think the layout of the main site is actually pretty smart. I appreciate the very superficial look with little menus to go through. – A search function for the blog is not a real necessity as long as contributers state the country in the topic title of their new topic (followed by whatever they like): if you type ‘ italy mammalwatching ‘ into Google it consistenly shows all post on the weblog on Italy. – I like the blog by the fact that the information density is unrivalled. I am planning a trip to South Africa and the amount of unuseful information on Safaritalk and the like is maddening. It is all about food, common birds, and flatscreen tvs. The way of posting in this blog may holds people back to do a post but is really effective in naming only relevant information to someone’s questions. – It would be GREAT if it is possible for everyone to make notes in each country page on the mainsite to add additional information on trip reports and name parks not mentioned in the reports. I am terrible in finishing my trip reports but would like to share lots information in the form of notes and reviews. Be able to post a brief note after having read a trip report to complement it with your own experience would lead to great completeness. Here is an example: I visited Way Kambas in december 2012 and based my trip on Richard Webbs truly fantastic 2012 trip report. I would love to leave the following note under the report with: “Visited Way Kambas in 2012: report info and prices up to date. Cannot recommened the lodge and guides enough. Book at least 2 nightly boat excursions: stayed at Raja Gajah Swamp tributary until dusk and spotlighted along main river back to lodge and saw Flat-headed Cat and Otter Civet minutes after each other on the northern river bank. Hari had seen Otter Civet twice before (one in daylight in Raja Gajah tributary) and only had undertaken nightly water excursions with 2/3 prior guests. Saw Small-clawed Otter in early morning boat trip on Way Kanan tributary. Best animal during park road nightdrives: Banded Palm Civet (once). Hari and the driver are extremely helpful and combining a nightdrive with an spotlighting boat excursion is just fantastic (spotlighting boat excursion the other night only brought mouse deer). A Tapir crossed the park road in front of a ranger during our stay. Hari had seen Sun Bear in the past near junction main tributary/Way Kanan tributary. I think I know what you mean, Maurice. I kind of like the fact that mammal watching isn’t so big and mainstream as birding. Maybe a crusty, cranky old blog like this is really the best for us. I’m getting a little crusty and cranky myself, and there’s a certain comfort in it. Dear all, thanks very much for these thoughts. I get the message that the current forum can be off-putting: perhaps in part because people feel a bit intimidated to post if they think they might be “wasting space” (believe me you won’t be wasting space so please don’t feel that). But the flipside is that a more standard forum might lose in quality what it gains in quantity. Obviously I think we want to encourage more people to take part but not so many that we lose focus, nor people whose sole focus is too argue (luckily for the moment at least we are the nicest bunch of naturalists in the world!). Tricky to balance all this I know… So I will try to reflect on these ideas over the next few weeks. Meanwhile if anyone is a reddit fan then here’s a page (thanks Matt Miller) that we can also use… http://www.reddit.com/r/mammalwatching/ I haven’t figured it out yet. I also can see that Facebook is not everyone’s preferred option! Wouldn’t it be great if we could all use our own favorite media and sites and that they would somehow cross post automatically whatever was most relevant… Oh well. Anyway, thanks again for some really useful feedback and ideas. I like Richard’s idea for guide recommendations. I would also include wildlife lodges and other accommodations particularly good for mammal watching. I think there are some out there and they are good to know about. For the reddit site, I think it would be good to fill in the sidebar to explain what it is, i.e. “the site for people who want to see mammals in the wild.” I would also include some ground rules, otherwise you will get people posting zoo babies, water skiing squirrels and stuff like that. It would also be good to send the link to moderators of other reddit sites so they can promote. I would send to naturalist-based ones like birding and zoology. I would not send it to the “animal theme” ones — like “squirrels” or “camels” — they are for the most part horrible and just post cute “meme” photos, not biology or other relevant information. The different social media platforms can be painful, and I understand the sentiments above about Facebook, etc. But there are some mammal watchers who undoubtedly use Facebook but not the blog, etc. I know there are some avid and accomplished mammal watchers on Twitter who I don’t see on this site (Kristofer Helgen, for instance). Finally, I do think Paul Carter raises an interesting point. Jon, what happens when you “hit the wall” — when you have ticked okapi, saola and Sasquatch, and move on to beetle watching. We all appreciate your extraordinary efforts on this site. But is there some way we can ensure you don’t burn out on keeping the site up to date? (Un)-fortunately, seeing all the interesting mammals of the world is impossible – too many live in politically unstable regions or are burrowers. Actually, I think it is possible if you live long enough and have a few millions to spend. With birds some people are getting fairly close, and birds have a lot more endemics on remote islands (not to mention double the number of species). Hi Matt, thanks for all this… so far as succession planning goes then I have given this no thought (either for my site or life… I really ought to make a will sometime too really). Ideally I hope that most aspects of the site and the other bells and whistles around it will move to some sort of wiki approach where everyone can update everything. There’s a lot of willing and active people out there ready to do this I know and so the onus is on me to figure out the technology to do this. I’ve no plans to bird or beetlewatch just yet either…honestly. But in terms of passing on the domain and the passwords then perhaps we need a Vice President who would get the launch codes in the event of my coming a cropper. He or she would never be allowed to travel on the same plane as me of course 🙂 Any volunteers? I’ll be happy to volunteer, but I really think you need two vice presidents rather than one. I liked traveling with you for solenodons, and hope to be able to go somewhere else together. Congratulations for the 10 years! I agree with many users that forum format would be more accessible. You can keep it on topic by including ‘Hyde Park’ section and strictly deleting posts. There are also functions like time delay after registering which would keep away most spam. No facebook, no reddit, please, they are niche products. Good point by Richard Webb about people looking for good guides. I think it is best solved by including commercial guide address in trip reports. I agree that people (including me) need commercial guide in practice, but there is no good way to list guides without the list becoming meaningless (good and bad people listed together, some adresses no longer functional, guides self-promoting etc). Overall, there is bunch of travel and bird forums, which you can take as a model for your site. Response – ‘how to link trip reports in a forum’ -all the forums I know allow attaching word, pdf and similar formats of documents. It is only author’s task to put the report in a relevant country section. It could be a separate section of a hypothetical forum ‘Trip Reports only’ with another section about more general discussions about country, RFIs etc. It would be great to have option of commenting to trip reports: people confirming/denying places to observe mammals, clarifying details of access etc. BTW, Jon, you could possibly live off such a forum if you started including commercial safari and whale tours and rankings (not that I recommend it at all). Also “hip hip hurray” from me for 10 years of mammalwatching.com! This site has been a major inspiration for the last 5 years. I’ve spent many hours browsing through the trip reports and the forum. Before I knew this site, I had no idea that it was possible to see all these amazing mammals. Of many I didn’t even know that they existed! Using mammalwatching as a guideline, our trips and holidays have a clear focus now and I’m lucky that Tim enjoys this focus as much as I do. In the past 5 years, I’ve seen 3 times more lifers as in the 15 years before. At first, I could only look at the many pictures in the trip reports with slight up to intense feelings to of jealousy but by now I’ve had so many of my own great wildlife encounters (although it’s of course never enough!). I really like the concept of the site. It’s easy to find the reports you need. The links (almost?) never fail. Of course the usefulness of the trip reports can vary a bit, as has been discussed on the forum before. In general, the information makes planning a trip so much easier. The forum takes some getting used to, but I have the impression that more people are starting to use it now. I understand that it is a bit intimidating to post, especially if you’re not a die-hard mammalwatcher, but I think that many people – like us – integrate holidays with a good deal of watching mammals. 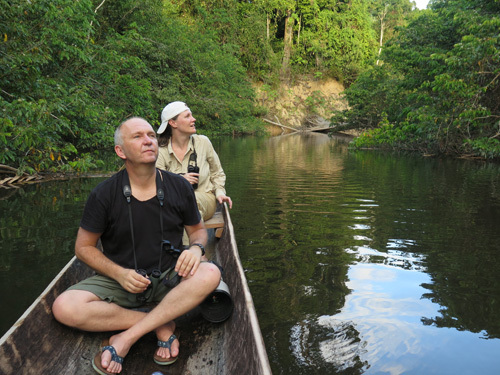 Not everyone wants to or can go to great lengths to see just one or a couple of species (although wouldn’t it be great to see Javan rhino, pygmy hippo, Siberian tiger or okapi…*sigh*). Information, questions, opinions, experiences of semi-serious mammal watchers is hence also of great value. Maybe it could help to have step-by-step guidelines available on how to use to forum? I’d say: on to the next great 10 years!! !